Looking for a change of pace? The Sleepy Hollow Half Marathon has the best of fun and scenery. It is the perfect event if you enjoy running for fun or are gearing up for a spring marathon! If you are Boston Bound – Better run here first!! The Sleepy Hollow Half-Marathon features approximately 5 miles of carriage roads and groomed trails (meaning crushed gravel and dirt) in the Rockefeller State Park Preserve. The 13.1-mile USATF-certified course also travels along the Old Croton Aqueduct and, as in past years, winds through picturesque neighborhoods in Sleepy Hollow. The idyllic landscape and scenic views of the Rockefeller State Park Preserve now make up part of the course due to construction and development along sections of the Sleepy Hollow waterfront. We are thrilled to make it possible for you to race on the same spectacular carriage roads and trails that serve as a training ground for many of the areas top runners. And if the magnificent Hudson River views on our new course don’t take your breath away, the hills on our course will! If you are staying at one of our local hotels please arrange your race day transportation directly with the hotel. 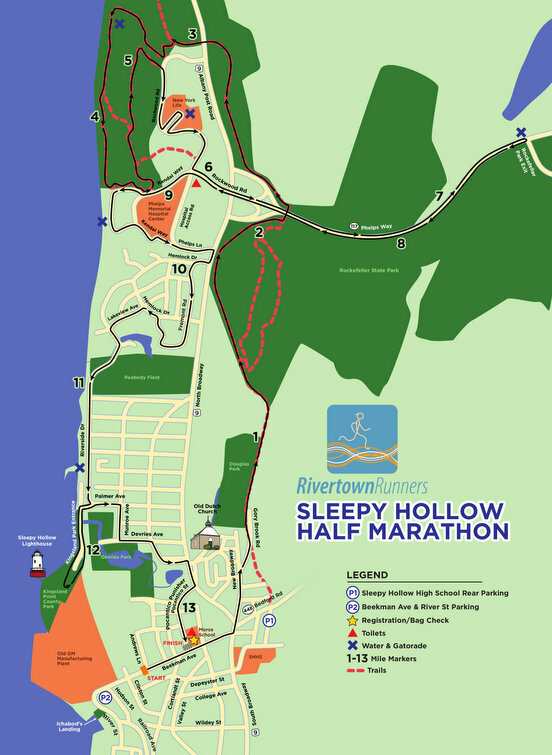 The course for the Sleepy Hollow Half Marathon features approximately 5 miles of carriage roads and groomed trails (meaning crushed gravel and dirt) in the Rockefeller State Park Preserve. The 13.1-mile USATF-certified course also travels along the Old Croton Aqueduct and, as in past years, winds through picturesque neighborhoods in Sleepy Hollow. The idyllic landscape and scenic views of the Rockefeller State Park Preserve now make up part of the course due to construction and development along sections of the Sleepy Hollow waterfront. We are thrilled to make it possible for you to race on the same spectacular carriage roads and trails that serve as a training ground for many of the area’s top runners. Download the Official Course Map! Download the printable Official Course Map as a pdf. Each finisher will receive a 2019 Sleepy Hollow Half Marathon medal, sponsored by Phelps Memorial Hospital Center. Please view our Parking Map for information on parking around the start/finish area. *Please note that due to road closures on Beekman Ave you may need to take an alternate route to the parking lots. Sleepy Hollow High School – the high school back parking lot is located off of Rte 448. Coming from Broadway/Rte. 9 take 448 (Horseman diner on corner – 276 N Broadway) and the parking lot is a few hundred feet on the right. You can walk down to the race start. Take the Metro North Hudson Line to the Tarrytown Station. 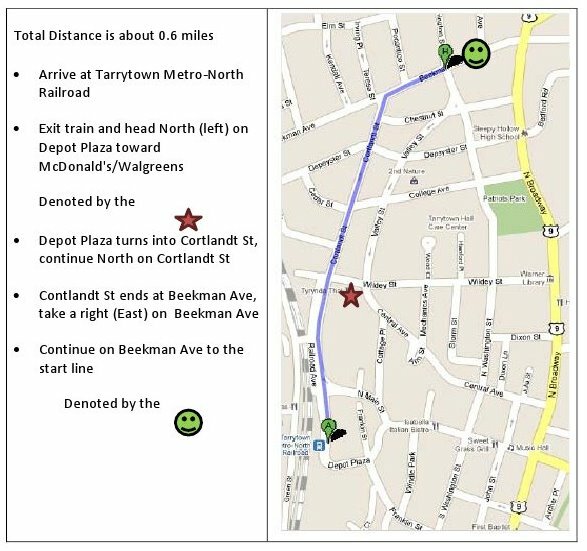 From the station go left down Depot Plaza/Courtland St. heading towards McDonalds, then Cortland St. up to Beekman Ave. There will be race volunteers posted at the station (exit train on east side – opposite the river) to assist you. Take EXIT 9 toward US-9/TARRYTOWN/SLEEPY HOLLOW. Turn LEFT onto WHITE PLAINS RD/RT-119/TARRYTOWN-WHITE PLAINS RD. Turn RIGHT onto S BROADWAY/US-9. Take 287 East/I-87 S/NEW YORK STATE THRUWAY S/TAPPAN ZEE BRIDGE (Portions toll). Take I-87 N towards ALBANY (Portions toll). For more information please contact Todd Ruppel, Race Director at tr.rivertownrunners@gmail.com.